Later that same year, the 600-page FBI file  on Davis was released, demonstrating Davis’s involvement in alleged Soviet espionage. Davis was even on the FBI’s internal security index, which was reserved for individuals who were considered wartime threats to the United States. Again, the media showed no interest, apparently realizing that the Davis connection would derail Obama’s campaign for the White House. Gilbert’s interest in the topic has now extended to members of Barack Obama’s own alleged family. He interviewed  Malik Obama, Barack’s alleged half-brother, about the subject of Barack Obama’s father. 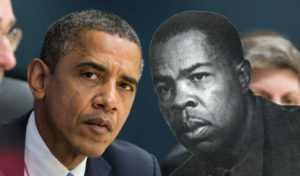 Malik Obama told Gilbert that he wants a DNA test and believes Frank Marshall Davis is the real father. As we have noted  in the past, the same Obama campaign apparatus which asserted that Davis was just a black civil rights activist also claimed that Obama was a baptized Christian. However, Obama acknowledged in his book Dreams from My Father that his grandfather was a Muslim (page 104) and that he spent two years in a Muslim school in Indonesia studying the Koran (page 154). There is no evidence Obama was baptized as a Christian, in any formal sense, in Jeremiah Wright’s church, and no evidence that Obama ever specifically rejected Islam. All of this may help explain why Obama’s policies seem designed to benefit America’s enemies at home and abroad, including what Frank Marshall Davis called “Red Russia ,” as well as the Muslim Brotherhood and its various fronts.